Buckwheats have branched stems one to three feet tall, and large, three to six inch, densely hairy, leathery basal leaves. 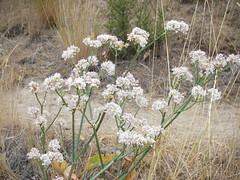 The flowers, individually very small, form dense single or multiple umbrella-like clusters, called umbels, at the end of the upright, nearly leafless stems. Each small flower has three sepals and three petals. The color of the flowers varies among and within species from white to yellow to pink or reddish, but all tend to darken to yellow-red as they age. Buckwheats provide an important nectar source for shrub-steppe bees. The seeds of desert buckwheats are a favorite food for many birds and rodents.